The John Lennon Wall is a tourist hot spot, and the perfect Instagram location known for its colorful and ever-changing artwork. When visiting Prague a visit to (and picture at) the wall is a must. But, many people do not know the true meaning behind the wall and why it holds such great importance to it’s citizens. The John Lennon Wall symbolizes freedom of speech and the non-violent resistance of the Czech youth. The wall started in 1980, shortly after Lennon was murdered. Although John Lennon never visited the location of the wall, it was crafted as a symbolic burial site by the youth of Prague. Young artists and activists took to the wall to thank Lennon and to continually spread his message. Lennon was admired by Central and Eastern European youth for his music that preached happiness and freedom, something they did not have during the Totalitarian-Communist era. During Communist rule, John Lennon’s songs and many other western pop music was banned. Musicians and citizens were often arrested if listening to or playing his music, but their support for Lennon persevered through the communist rule. From the start, Communist authorities worked to whitewash the portraits and lyrics of Lennon. But, the activists were persistent in spreading their message. Whether their artwork was painted over, surveillance cameras were put in place, or security guards were on guard, the young Czech people still managed to get their work on the wall. This small act between Communist authority and Czech youth is known as a small fight for a brighter future. Once covered in Anti-Communist graffiti, the wall is now a world symbol for peace. 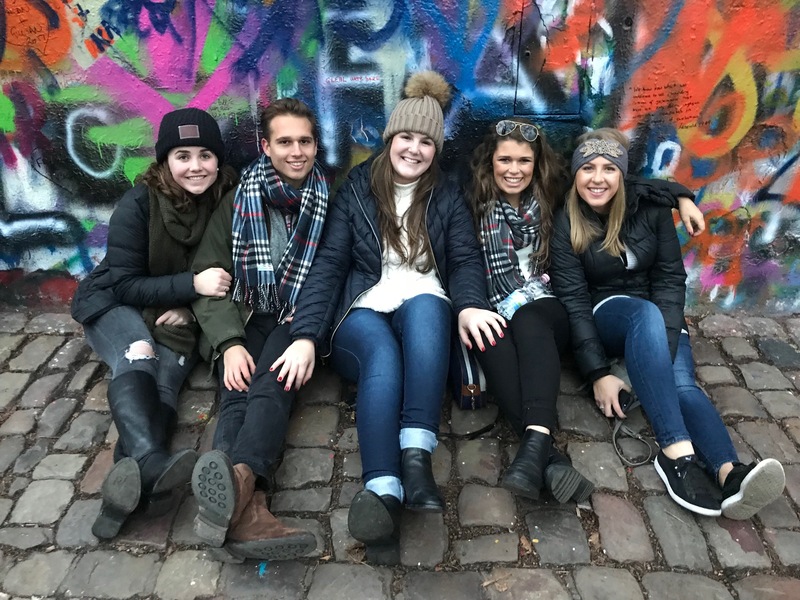 Located at Velkoprevorske Namesti, Mala Strana, Prague, Czech Republic – a visit to the iconic wall and to beautiful Prague is a study abroad bucket list destination you don’t want to miss.